Over the years many surgical techniques have been described in the literature for the treatment of inferior turbinate hypertrophy (ITH) but the debate for ideal procedure is still on. In our study we are comparing two surgical procedures namely submucosal resection (SMR) of inferior turbinate and Powered inferior turbinectomy (PT) for the management of ITH. Surgical procedures are to be analyzed in terms of results and complications by subjective and Objective assessment. A prospective study was conducted from 1st December 2011 to 1st June 2013. Subjective assessment of nasal obstruction was done by visual analogue scoring before surgery and graded into none, mild, moderate, and severe. 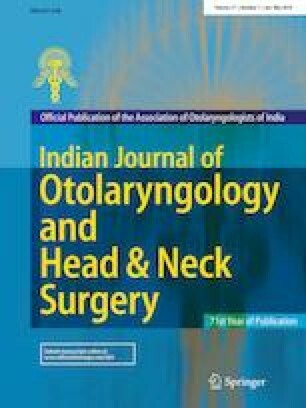 Patients were also subjected to nasal endoscopy for objective assessment of inferior turbinate size and graded as I, II, III. A total of 60 patients were operated (30 patients in each group), patients in Group A underwent SMR and in Group B patients PT was performed. Patients were assessed for various parameters like age, gender, laterality, intra operative and postoperative complications. Overall improvement of 66.7% in Nasal Obstruction and 76.7% in size of inferior turbinate was seen in Group A, whereas improvement of 90% in nasal Obstruction and 83.3% in size of turbinate was seen in Group B. Both SMR and PT are efficient methods for relieving nasal obstruction related to ITH. However, the results in our study confirm that PT is a safe and effective procedure in relieving nasal obstruction and enabling optimal volume reduction with preservation of function of the inferior turbinate. First Author and Co-Authors declare that they have no conflict of interest. Research Involving Human Participants and/or Animals: Nil.